> > > highly competitive markets are spending effort on useless product changes? > None of your post provided any other real evidence or logic. > > > How easy do you think it is to double floating point performance? > > easy, if your FPU is small compared to the rest of the core, it is also cheap. 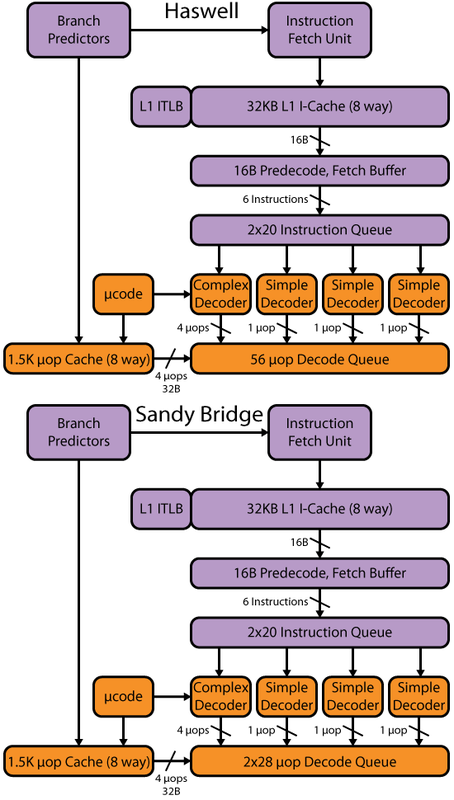 > Intel doubled SIMD width in SandyBridge and had to redesign the pipeline to be PRF-based. 1. An all-to-all (from all functional units to all reservations stations) common result bus, sized to accommodate the largest possible result from each functional unit. Reservation stations use this to "capture" any virtual operands they may be waiting for. The savings from doing this aren't as large as you might think, though, because to maintain the same latency/performance in a PRF design you have to implement forwarding networks that partially replicate the result bus. You come out ahead only inasmuch as you can "prune" those forwarding networks. For example, I believe that SB only implements forwarding within each functional unit "stack" - Inter-stack dependencies go through the RF. 1. Intel also used PRFs in their previous all-new high end microarchitecture (Pentium 4, which only had SSE), so they were headed in that direction long before AVX. I suspect that Merom and Nehalem used RS-based backends mostly because of their P6 heritage. SB was their first new high-end uarch since they abandoned P4 and therefore their first real chance to switch to PRFs (again). > > horrible integer performance, that's exactly what Linus were arguing against. > to a GPU-like core would be a cheap way to win useless benchmarks. How do you think a GPU would perform on, say, SPECfp or even something like whetstone?